We have moved our Press Room page for a better viewing. Click HERE to proceed. Bisma Eight affects guests unlike any other; an immersive, hidden sanctuary of relaxation and tropical vibes that flow effortlessly throughout the hotel and make the urge for guests to stick around a while even greater. • ONE MORE NIGHT 2017-2018 • See it in BLOG. Copper Kitchen & Bar's own chef in the lead Chef Ben McRae teaming up with Top 5 Culinary Art chefs and Sake Master Chef Hitoshi Sugiura of Patinastella, and Tokyo's own Buddha Bellies Cooking School Founder, Sake Sommelier, and Sushi Master Chef Akiyama Ayuko showcasing a six-plate of mouth-watering Japan-inspired dinner paired with the finest Sake collection. • SATURDAY, JULY 8TH 2017 • See it in EVENTS. The second instalment of chefs' collaborations between Chef Mandif Warokka of Blanco par Mandif and Copper Kitchen & Bar's Chef in the lead, Ben McRae. The Roots of Craft speaks for itself in showcasing 6 plates of food craftmanship of the highest order. • SATURDAY, JUNE 17TH 2017 • See it in EVENTS. Ubud, Bali. If it isn’t on your culinary radar, it really should be! Over the last few years, the small town in the tropical jungle-laden uplands, has become a mecca for food aﬁcionados from all over the world. Bali’s natural and cultural capital sets the perfect backdrop for a heady mix of bothIndonesian and international cuisines, and the Ubud food festival 2017 is just the icing on the cake,as once a year global food lovers descend on Ubud to witness celebrated culinary icons from around the world, as they dish up a program rich in fresh tastes and even fresher ideas. Leading the charge at this years event, is the best restaurant in Ubud, Copper Kitchen & Bar by Bisma Eight. Long established as the pinnacle of seasonal, earth friendly dining, and the year round destination for world renowned chef collaboration events; the contemporary rooftop restaurant hosts another award winning collusion, as they bring you Bali’s first official 6 course craft beer & food pairing collaboration, in association with Beervana Indonesia, L’Atelier de Joël Robuchon, Bangkok,and internationally recognised chocolatiers, Valrhona, France. Yannis Janssens of L’Atelier de Joël Robuchon, Bangkok, join Copper’s executive in chief, chef Ben McRae, to perfect 6 dishes that showcase mouthwatering tastes from both of the culinary masters. All paired with the ﬁnest craft beers from around the world. Robuchon X Copper promises to be the highlight of the 2017 festival, and through creative imagination and inspired delivery, the pair guarantee to produce a mouthwatering taste sensation, teasing and satiating even the most discerning of palates into submission. Besides his experience heading the pastry line for one of Bangkok’s most immersive dining experiences, Chef Yannis has been awarded the coveted `Top Ten Pastry Chefs` in America Award for his trendsetting dessert style; represented the US at the International C3 Competition in Madrid,where he won the Press Award, and more recently standing as a panel judge for the Grand Concours Culinaire in The Netherlands. His innovative culinary insight and creative ideas continue to garner international recognition as he oversees all the pastry and bakery development for the Robuchon Group, and he is the perfect choice to hold court with Ubud’s most enigmatic cuisinier, Chef Ben McRae. McRae’s adaptation on savoury dishes, combined with an expert beer pairing knowhow, makes this a match made in heaven, as six courses become one relishing explosion of sweet and savoury flavours. The Ubud food festival continues to go from strength to strength, and each year is better than the last; though Robuchon x Copper is set to be the ‘event of the event’ in 2017. Not since Wonka’s gold wrapped chocolate has there been a more eagerly anticipated queue to own a ticket, for what is destined to be a memorable evening in almost fantasia like surroundings. Luscious, delicious and fragrant are not just synonyms for the 3 plates due to be presented by each chef, they also sum up the enviable ambience on oﬀer at Copper Kitchen & Bar’s rooftop terrace, where the culinary creations will be served. Picture low slung, soft twinkling lights, the flickering of candlelight on each table and the redolent aroma of earthy woods and tropical ﬂora that simply enchant you; Copper is a place where all of your senses come alive. A culinary destination where the crossing of cultures, celebration of good food and an inﬁnite connection with friends new and old can be found. Experiences here don't just last the evenings service, but are memories that stay with you for a lifetime. Tables are available for up to 40 people, and both hotel guests and non-hotel guests are invited to join the 6 taste collaboration. Optional beverage pairing is also available for those who wish to really immerse themselves in a palatable infusion, but all are welcome to celebrate the Ubud Food Festival this year, on the rooftop with Copper Kitchen & Bar. Bisma Eight is a boutique hotel experience set within the natural and cultural heart of Ubud. Rooted in the artisan heritage of central Bali, Bisma Eight is something entirely different from what people have to come to think of as staying in Ubud. For more information, images, interviews and content please contact Mr. Robbie Woodward at Ohana Communications. Executive Chefs are the order of the day this Easter, as the charismatic Nick Honeyman, joins Copper Kitchen & Bar’s resident in chief, Ben McRae, to headline a weekend of entertainingEaster events, at Ubud’s multi award-winning, boutique lifestyle hotel, Bisma Eight. The Balinese capital of cuisine, Ubud, is renowned for attracting innovative foodies from all over the world. Culinary icons continue to be drawn by the fresh, exotic ingredients that the town and its surrounding regions afford them; and the vibrant restaurant scene that occupies a proverbial rabbit warren of streets and alleyways in Ubud’s town centre, shows no sign of slowing down. Leading the charge on this foodie revolution is the authentic, ethical and inspired, Copper Kitchen & Bar. The idyllic restaurant, poised high in the jungle canopy, has captivated the imagination for an endless stream of chef collaborations already this year; inviting their friends from the world of food and drink to participate in a string of impressive events at the iconic food house. The “Easter Feaster” sees this latest of synergies fall consciously in the midst of Easter weekend, and promises to be a celebratory highlight of locally sourced produce, delicately bought together with international finesse, by two of the world's most inventive Executive Chefs. South African born and raised, Honeyman left his motherland at the tender age of eighteen, to pursue what can only be described as: "a burning passion for cooking” and now in his 30’s, he’s no stranger to the heady heights of culinary mastery, and the experience that naturally comes with it. Stints at the tri-Michelin starred Astrance and Arpège restaurants in Paris, and an Executive posting at Soﬁtel Auckland, have seen the roving chef find an almost spiritual home in both cities; most recently opening the classic French Bistro ‘ParisButter’ in Auckland's Herne Bay,whilst flying to the south of France eight weeks of the year for his seasonal restaurant, Le Petit Leon. The highly accomplished duo are both known for their adventurous streaks, fearlessly mixing flavours and techniques from their vast array of worldly travels; and the in vogue pair are truly synonymous with the ideas of versatility, rusticity, and progress, that embody the very sensations one experiences whilst dining at Copper; a sincere culinary destination that offers a reﬁned take on modern-casual dining. Opening together, with an amuse bouche trio of Amed line caught sashimi, the two chefs will then continue to alternate dishes, balancing the tastes from course to course. Ensuring that the drama that unfolds from the kitchen, is as Oscar worthy as the unrivalled ambience that can only be felt, from the rooftop restaurants warm, orange, woody charm. Honeyman will lead with Ora king salmon tartar, cauliﬂower mouse and dashi jelly, as Chef Ben follows with shellﬁsh tortellini, lobster bisque reduction and wood ﬁred fennel & ﬂowers. If you haven't already started to salivate with anticipation, the cured to perfection Beef tenderloin with soubise truﬄes onion, brown onion puree & duxelles might just take you over the edge, but be sure to save room for dessert as both promise to bring a suitably sweet ending to the dinner,leaving guests to soak up the enviable surroundings of volcanoes, lush tropical forest and uninterrupted views of the bright moonlit stars. Tables are available for up to 60 people, and both hotel guests and non-hotel guests are invited to join the 7 course collaboration of executive order. Optional beverage pairing is also available for those who wish to really immerse themselves in a palatable infusion, but all are welcome to celebrate Easter this year, on the rooftop at Copper Kitchen & Bar. Collaboration season is in full swing at Bisma Eight’s rustic rooftop restaurant, Copper Kitchen & Bar, and for the second Chef coalition of the year, Executive Chef Ben McRae invites former MasterChef contestant and food author, Petty Elliott back of house, to run the pass on a 6 taste archipelago dégustation set beneath Ubud’s graciously intoxicating moonlit sky. As the full moon performs its lunar showcase above the lush, tropical paradise on April the 11th 2017, the latest in a series of Chef collaborations will see “Nusasense” replace Bisma Eight’s monthly Moonlight Dinner; and follows the eagerly anticipated 16 plate taste sensation, “Blanco x Copper” on March 17th. As always, you can expect every one of your senses to be heightened, as both Chefs embody a desire to craft flavoursome dishes from an earth friendly disposition. Elliott with her homage to her upbringing in North Sulawesi, and McRae with his international experience, heading the galley for some of the world’s finest eating establishments. Raised in Manado, North Sulawesi, Elliot sites Britain as her second home, and the two tiny islands play a huge influence on her cooking style and flavours. Pioneering modern Indonesian cuisine with authentic European flair has become her globally recognised signature. Whilst Aussie McRae, leads the way with his high culinary art and a passionate earth-to-table identity; sourcing only the finest fare from the Amed Fisheries, the Tegallalang reserve and The Gardens by Bisma Eight. This most recent of palatable alliances, will see guests rendezvous at Ubud’s leading gastronomic home, Copper Kitchen & Bar, to sample the Chefs signature dishes, whilst dining in exquisite company and the most enviable of surroundings. Endless vistas of fertile green jungle provide the backdrop for the full moon to send shadows dancing across the rooftop restaurant, bringing an air of fascination and fantasy to the evenings proceedings. Ubud is widely known for its thriving culinary scene, and people flock from far and wide to sample the abundance of diverse cuisines on offer; it’s by far the best place in Bali to learn about the islands culture through food, but Copper Kitchen & Bar continue to innovate with their authentic, ethical and inspired dining experience and the latest of Chef collaborations only enhances what is already an event well worth getting dressed up for. Less we forget the delectably curated pairing accompaniments, that will have your taste buds perfectly poised to appreciate the unique flavours every new dish brings. What’s better still, is that all beverage pairings are included in the price! Just in case you were wondering why Bisma Eight have titled the event “Nusasense” then perhaps a little geo-language lesson might fill in the blanks for you. “Nusa” is “Bahasa” or the word for language, and means an Indonesian Island outside of Java Island. “Nusantara” on the other hand originates in Old Javanese, and literally means “archipelago"
Now we’ve got that covered, let’s put it into context: Both chefs will create dishes that originate from Sulawesi, combined with exotic spices and Balinese flavours straight from earth-to-table. That’s Island inspired cuisine, from two islanders, expertly crafted on an island. Makes complete Island sense, Right? It’s hard not to fall in love with Bali. It’s even harder not to fall hopelessly in love when in Bali; which is why the small Indonesian Island has long been the wedding destination of choice, for couples who wish to celebrate their commitment to one another in tropical paradise. It’s amazing how such a small and simple word can change your life forever. “Yes!” The answer that marks your next chapter; the precursor to saying: “I do” and a promise to share the rest of your life with the one that you love. As simple a word it may be, this is just the beginning of your story, and the memories that you are about to create will last an eternity. Beyond the perfect wedding dress and the timeless endearments that you and your betrothed have carefully penned for each other, your fondest sentiments arise with a distinctive choice of wedding venue, and Bisma Eight has it all. adorn the pergola, as their scent guides you to the altar where your future awaits. The soft and gentle Ubud breeze whispers sweet nothings, allowing you both to remain endlessly in the moment, as your commitment or blessing ceremony comes to life. Your guests will be well tended by the ever-present service team, and will be encouraged to stay with you as inspired and authentically crafted cuisine, is delivered by the award winning chefs of Copper Kitchen & Bar. Glasses can be discreetly filled with your choice of beverage, leaving you to share your moments with family and friends. All will be well taken care of, so you don't have to worry about a thing. Almost on cue, natures very own entertainment provides the most magical of light shows, as the sun sets amidst the panoramic jungle views that literally embrace the exquisitely appointed hotel grounds. All of this comes as standard, though Bisma Eight is anything but ordinary, it’s an immersive and effectual place that means something different to everyone who visits, and whilst unwavering tranquility and majestic sunsets have to stay, each and every element of your wedding can be bespoke and tailored toward your innermost requirements. Attention to detail is everything, from the intricate wooden carvings that grace the elevator walls, to the shadows cast from the thriving tropical foliage and palm fronds, bordering the pathways toward the spacious and indulgent suites; so naturally the details of your special day are as important to the Bisma Eight family as they are to you. The most memorable day of your life should be as individual as you are. Begin your next chapter with “The Wedding by Bisma Eight”. For more information, hires images, and content please contact Mr. Robbie Woodward at Ohana Communications. A week in Bali never feels long enough, though at the same time, a few days on the “Paradise Island” can feel like you’ve been there forever. There is a sense of belonging that overcomes even the most enigmatic of strangers; from the moment you step of the plane, to the day you must force yourself to venture home, endlessly eager to return. Nowhere evokes this sense of inclusion quite like the immersive and tranquil inner sanctum of Ubud’s most sensory abode, Bisma Eight. A boutique hotel unlike any other, deeply passionate and humble towards the community in which it resides; standing proud with its distinct facade that blends seamlessly into the mature tropical backdrop beyond. A domicile that remains so tightly woven into the very fabric of its environment that as the Bisma Eight family come to celebrate their second anniversary, there is a communal expression and neighbourly outreach that surpasses the balloons and party poppers, and gives back as only Bisma Eight knows how; with unadulterated humility. Multi award-winning Bisma Eight turns two years old in February, and industry accolades aside, for Suraj Melwani, founder of Bisma Eight, “It’s the people that make the best injection of culture to any brand” so a plethora of events have been organised for the team to celebrate by getting involved with the wider Ubud community, serving as an inspiration to the way things should simply just be done. The weeklong activities begin on Thursday 23rd February with the now annual blood drive, where Bisma Eight employees, friends of Bisma Eight and the general public are all invited to donate blood at the hotel, with the aim of giving the most precious gift that anyone can give to another person — the gift of life. Friday 24th will see the Bisma Eight board of directors visit the nursing house at Panti Social Tresna Werda Wana Seraya, where they will deliver donations made by the Bisma Eight team, whilst Saturday plays host to a cleaning blitz of the Bisma Roads that run from the main Ubud town centre to the scared monkey forest; a venture that ensures human impact is kept to an absolute minimum. The planned activities speak to the truly appreciative nature of the Bisma Eight family and the unpretentious outlook that comes from being Bali’s leading resort in Ubud. It’s not simply about having impeccable service, and it goes far beyond the exquisitely designed suites to a wholesome acknowledgement of being allowed to co-habit the natural and cultural heart of Ubud. All that said, it is their 2nd anniversary and everyone deserves to celebrate with a little fun and gaiety, so all Bisma Eight employees and their families will make Sunday their own. A fun filled walk starts the day and returns to The Gardens by Bisma Eight, for a celebration Bali style! Traditional Balinese dance opens proceedings, with speeches from the committee chairman and board of directors leading to the business end and the eagerly anticipated birthday celebrations; which of course will see the customary karaoke competition unfold - You didn't think there would be no Karaoke did you? Throw in some Tumpeng (#delicious) and entertainment from all of the internal departments and you’ve got yourself a memorable birthday bash where everyone will endeavour to be on the guest list. To cap it all off, over the 2nd and 3rd of March, a trip to The Sila’s Agrotourism & recreation park is scheduled as a huge thank you to all the team for their hard work and commitment to making Bisma Eight the most effectual and immersive hotel in Bali. Suraj Melwani is a wise man, people really do make the difference, and for Bisma Eight the difference comes from their very own people. People that not only care that you have the most meaningful experience when visiting Ubud, but who also remain true to their social and cultural responsibilities, safeguarding the future of their neighbourhood for many more anniversaries to come. Happy Birthday Bisma Eight! You absolutely deserve it. The saying: “Too many cooks spoil the broth” isn’t strictly true. Especially when two of Ubud’s finest masters of cuisine, join forces to produce a 16 plate taste sensation, that will leave you wondering why you ever just settle for a starter, main and dessert. For what is set to be the most highly anticipated culinary event of the year, and in food-fanatic circles, the most harmonious unity since Beyoncé got the girls back together for the Super Bowl, the only questions left to ask are: Who, when and where? For one evening only, on Friday, March 17th 2017, Chef Mandif Warokka of Blanco par Mandif, and Chef Ben McRae of Copper Kitchen & Bar share the polished steel worktop, to craft an Asian inspired menu with a refined, earth-to-table dedication, using locally sourced produce from the Amed fisheries and the Bisma Gardens. McRae welcomes Mandif to Copper Kitchen in the first collaboration since taking the reins as Executive Chef, and the two share an intrinsic passion for keeping Indonesian traditions alive; applying ethical, regional fare, to compose mouthwatering dishes that are the highlight of the seasons. event, and who's critical attention to detail, only compliments McRae’s ability to combine Indo-Asian flavours with international flare and creativity. The informal dinner will be hosted by Bali’s most quintessential of boutique hotels, Bisma Eight, in the heart of Ubud’s breathtaking, tropical jungle; and be it the warm and rustic inner comfort of Copper restaurant, or the elegant rooftop that extends deep into the lush green beyond, guests will be free to seat themselves at any place setting they wish, and are invited to experience an evening of good vibrations and inspired gastronomy, beneath the soft ambient glow of the ever present moon and stars. The multi-award winning chefs have both chosen 8 proportional dishes; each showcasing their own individual signature and craftsmanship, but all expertly designed to work in sync with the other. And if you think 16 plates in one sitting sounds reminiscent of a raucous viking banquet or a little too much for one to digest, then think again. Chef Mandif and Chef Ben have delicately curated each dish to be the perfect portion size, executed to tantalise your senses: teasing the palate from amuse-bouches to chocolate finales in complete symphony, and leaving plenty of room for a second and third look at the accompanying pairing menu. Known for it’s innovative accommodation of creative concepts, the 2017 events calendar is really starting to busy up for Bisma Eight, and without exception, this collaboration is one not to be missed. Spaces are limited, and early booking comes highly recommended, but if you are one of the 80 guests, fortunate enough to take a seat at Copper Kitchen & Bar for this once in a lifetime collaboration, you’ll be the envy of all your friends who couldn’t get a ticket as you tell the story of how you spent one night, with two award winning Chefs, at the most idyllic of restaurants in Bali. For more information, images, interviews and content please contact Ms. Caoilfhionn Maguire or Mr. Robbie Woodward at Ohana Communications. TripAdvisor has unveiled the best hotels in the world in it’s seventh annual Travellers’ Choice awards, and for a second year running, Bisma Eight gain winning status, having placed comfortably inside Indonesia’s top five. It has been an exciting and eventful year for Bisma Eight as they approach their second anniversary, and it means a lot to the hotel that the awards are based on the opinions of real travellers. As passionate advocates for Indonesian culture and devoted chaperons that help guests to discover and define what Ubud means to them, Bisma Eight give a heartfelt testament to those who have chosen to be a part of their story. Millions of guest reviews, comments and traveller opinion were all taken into account to see Bisma Eight leap a monumental 13 places since the last round of accolades. Sitting pretty at 4th spot in Indonesia’s top 25 hotels, and the only independent hotel to feature in the top five. The awards keep coming to Ubud’s most aesthetically pleasing address, and it’s easy to see why. Every element of what they do is compelling yet completely authentic. It’s an effectual, spiritual experience that is enviably hard to replicate; each moment mindfully crafted to encourage an atmosphere of relaxation and immersion. A thoughtful sanctuary that effortlessly delivers a sensory acquaintance, and a boutique hotel that is as unique and individual as you are. February 2017 will see Bisma Eight celebrate their second anniversary, and with the recent addition of new Executive Chef, Ben McRae, who brings an authentic, ethical and inspired experience to their very own Copper Kitchen & Bar; coupled with the appointment of Erick Hardiansyah, a charismatic general manager who delivers a unique understanding of how guests need to be delighted at every touch point, Ubud's finest residence is in safe hands to secure top spot come 2018. Twice TripAdvisor Travellers’ Choice Award winner; Bali Tourism Awards, leading resort in Ubud winner; Condé Nast Johansens finalist. Bisma Eight isn’t short on accolades, and they just keep coming. Needless to say it takes a special character, and steady hand to steer the helm of such a heavily awarded boutique hotel. Not least when it lies in Indonesia’s most visited tourist destination, Bali, and moreover, the natural and cultural heart of Ubud. So it is with great pleasure that Bisma Eight welcome Erick Hardiansyah to the Bisma Eight family, in his new role as General Manager. When every installation is a deliberate thought process; from the colour of the concrete walls that sit in perfect juxtaposition with the lush green jungle flora, to the body of water that makes a hotel lobby the most tranquil space imaginable, you can only applaud the level of attention to detail that would go into selecting the right person for the job. Bisma Eight isn't just another hotel. It’s an experiential, sensory acquaintance. It’s alive! It does all of this with an inner work ethic, that on the surface feels ironically effortless; and as Bisma Eight edges towards its second anniversary, it now has someone to help shepherd and nurture the future for the boutique hotel experience. Hardiansyah comes with a plethora of hospitality experience that began in early childhood. His formative years spent in Jarkarta, where he learned from both his mother and father as they crafted their trade, working together in the same hotel. Hardiansyah was still in junior school when his father passed away, though it was at this point in his life that he knew his own future would be in hotels. As a teenager he took a part time job in Jakarta with a four star hotel, to support his studies at hotel school. His tenacious yet humble attitude, combined with a charismatic smile would eventually win the hearts of five star hotels and their guests the world over. Climbing the ranks from bartender to food and beverage director, servicing luxury destinations in Sumatra Island, Malaysia and Bintan Island, as well as Coco’s Bodu Hiti in the Maldives, and Karma Resorts, Bali, before finally taking position as General Manager in Vietnam. If you don’t know your Pinot Noir from your Cabernet Sauvignon then Erick is your point of call as the sommelier shares his love and knowledge of wine. “Malbec is my favourite red wine” claims Hardiansyah “It’s uses very unique grapes, and pairs naturally well with the character of Indonesian food, especially the spicy dishes” he elaborates. Wine proficiency aside, Hardiansyah has a very distinct philosophy when it comes to his style of hospitality: ‘See what you serve and serve what you see’ - a basic belief system that he instills in his new Bisma Eight family. A fundamental starting block for sound service standards that he says, ensures the level of service always meets with a guests expectations. If you ever get to meet Erick Hardiansyah, ‘and when you visit Bisma Eight then you most probably will,' you will sense his innate ability to put one at ease. There is an infectious presence of calm throughout the resort, and Hardiansyah is the very embodiment that makes you feel like everything is under control. A facile understanding of how each individual guest would like to be treated, oozes from his wealth of experience and competence in his role. It’s not often, that something so well considered as the design and architecture of a hotel can be matched by the omnipresence of the man, (or woman for that matter) in charge. Though as they have from concept to completion, Bisma Eight continue to prove the majority wrong. The tranquil vibe and the effectual, holistic nature of the hotel all need a strong and deliberate custodian to ensure Bisma Eight continues to shine, and in Erick Hardiansyah, they now have a General Manager that works in complete harmony with every element of the hotel. Beyond his food and beverage excellence, Hardiansyah creates moments. Moments for guests, moments for his team, moments for everyone! His charismatic charm blends seamlessly with the hotel’s inner sanctum, and as he begins to create many new moments for guests and the Bisma Eight family alike, it is there for all to see that the future of this boutique hotel is now in safe hands. For more information and images please contact Ms. Caoilfhionn Maguire or Mr. Robbie Woodward at Ohana Communications. If you could disappear for a while, leave the daily hustle and totally disconnect from it all; Would you? Does the thought of silence, genuine peace and quiet and absolute relaxation sound like the stuff that dreams are made of? If you answered yes to either of these, then we have just the ticket; but Shh! It’s a Silent Escape. Ubud, in the uplands of Bali, Indonesia, is completely in tune with its historical significance. It plays host to some of Bali’s most recognised vistas and houses a myriad of ancient Hindu temples and shrines; not least the Goa Gajah (“Elephant Cave”) and the emphatic Gunung Kawi at Tampaksiring to the north of Ubud. It is a spiritual place, with a divine respect for all that reside, and all that Ubud welcomes. Even the monkeys here have their own sacred temples; and the community that surrounds, share a philosophical goal of creating peace and harmony for visitors from all over the world. Though one of the most anticipated occasions of the year marks a time for complete silence and utter reflection, as the heartbeat of Indonesia comes to an all-embracing standstill and the locals close their doors for Nyepi or “Seclusion Day”. What better time to escape to the serenity of Bali’s leading resort in Ubud, Bisma Eight; where the Ubud jungle’s rich green canopy kisses the polished, off-white concrete walls, and cocoons its residents in a place of placidity, like nowhere else on earth. As the international airport closes its entire flight schedule on the 28th of March, you can be safe in the knowledge that nothing will disturb the gentle whispering of the soothing breeze; and if you’re still worried about the rush hour traffic then fear not, as no motor vehicles whatsoever are allowed on the streets from dawn until new dawn. The perfect opportunity for a total switch off. A chance to reconnect with your inner peace and reboot yourself once more. When people say, ’unwind’ does it ever really happen? With the Silent Escape by Bisma Eight, they truly mean it. Take advantage of the seductively appointed guest suites that overlook the lush tropical flora. Each one instinctively designed to enhance your sense of wellbeing and serenity. Lose yourself as you bronze in the afternoon sun, finding contemplation an ease to natures melodious voice, as the volume of all modern additions are set to a minimum level. If the midday heat gets a little too hot to handle, then by all means feel free to cool off with your exclusive access to one of the “8 best pools in the world” as written by the MR PORTER Journal. Or if too much stillness is even remotely possible, then channel your relaxation towards one of Bisma Eight’s tailored in-house activities. Start with an energising yoga class on the rooftop above the palm trees, or try your hand at crafty master mocktail making at Bisma Eight’s, Copper Kitchen & Bar. You could also take an authentic Balinese cooking class, with award winning chefs on hand to show you how it’s done; and if you really wanted to immerse in the whole Ubud experience, then make sure you sign up for the Canang Sari (Balinese Offerings) or traditional Balinese Dancing Class, all delivered in a respectful and dutiful nod to the quietest day of the year. Nyepi is a different kind of New Year celebration, and the ‘Day of Silence’ is as unique as the opportunity modern day life affords us to zone out. Bisma Eight is something entirely different from what people have to come to think of as hotels in Ubud and the Silent Escape is just another part of their ever growing story. So it stands to reason then, that if a visit to experience Bali’s celebration of the Saka New Year is on your bucket list, and yearlong hectic work schedules leave you feeling a little burned out, you have no need to look anywhere else. Bisma Eight, the foremost boutique hotel experience in the natural and cultural heart of Ubud, Bali has done it yet again. An exquisitely curated experience that captures the true essence of Bali, and takes your typical tour package to a whole new level. Walk anywhere along the central strip of Ubud’s main town and you can guarantee two things. First, the offer of a taxi ride, seated on the back of many a moped that will happily take you to absolutely anywhere your fancy would desire! Secondly, a plethora of tour operators chancing their sales game and promising to deliver you the best sightseeing the island has to offer. Some of which are pretty good and if you wish to see what everyone has seen, then jump right in and take your pick; but none will create the lasting memories, and introduce you to the real Bali quite like the experience tours designed by Bisma Eight. Leading the way is the “The Bedugul We Love” aptly titled as executive, chauffeur driven and expertly tour guided vehicles from the Bisma Eight fleet, take you on a journey to the North of Bali and begin with the breathtaking Twin Lakes at Bedugul caldera. Complete with your very own on the road butler. Arrive as the sun is at it’s most pleasant, creeping out from the back of the lush rainforest- covered hills, to shed light on the majestic Lake Buyan and Lake Tamblingan below. Don’t worry, you’ll be there before the tourists, giving you unrivalled views and endless photo opportunities that will make you the Instagram envy of the world. As the heat of the day raises the thermometer, you will welcome a chance to cool off in the presence of the captivating waterfalls between Bedugul and Sigaraja. The refreshing streams that meander through the stone steps and wooden boardwalks, offer a tranquil backdrop to the Gitgit waterfalls that often split into two equal streams as they cascade 40 meters down to the rocky pool below. The adventurous choose to take a dip, whilst others simply admire the view. Either way, it’s an experience that won’t be forgotten quickly. Bisma Eight have thought of everything with this experience. Your driver and butler even know the best place to enjoy the mouthwatering picnic provided by Bisma Eight’s very own Copper Kitchen. How does a backdrop of Tropical Mountain Forest, Cacti, Orchids and Ferns sound? Amazing right? The Bali Botanic Gardens play host to lunch, and as a place for research and conservation, education and recreation, you have the chance to feel totally connected with the essence of Bali whilst you dine. There is a chance to shop for local handicrafts, souvenirs and exotic spices as the tour continues to the traditional markets of Bedugul. The highland garden of Bali is a melting pot of fresh, local produce and there is even a traditional art section too. To wrap things up Bisma Eight have really pulled out all the stops with a visit to the Baturiti Luwak Coffee plantation. A handpicked insider at the plantation, takes you on a voyage of Coffee discovery from growth to process, that culminates in the final produce. A cup or two of the highly valued Luwak Coffee, paired with tasty treats prepared by the Bisma Eight team, all with an awe inspiring view of the farmland vistas that grace this most beautiful part of the island. This isn’t just your average, run of the mill tour. It’s an infinitely well curated experience that speaks to the very heart of what Bali looks like, feels like and tastes like. Its immersive and tailored to awaken all of your senses, and leaves you with stories to tell that you most likely won’t have heard before. Bisma Eight, Ubud, and their rooftop restaurant Copper Kitchen & Bar is excited to announce the arrival of new Executive Chef, Ben McRae. Aussie born McRae joins the Bisma Eight family and headlines an authentic, ethical and inspired rotating menu with roots deep in the local soil that will see Copper Kitchen become the number one destination for foodies in Indonesia. McRae brings over 18 years experience to the kitchen from a diverse background at some of the world’s finest dining institutions. Chef Ben can count Iguacu Restaurant, Auckland, and Thailands prestigious Issaya Group as previous residence, though most recently, the Travel+Leisure Magazine accredited, ‘World’s best resort’ Nihiwatu, were privy to his culinary delights. Chef Ben ignites a new era at Copper Kitchen, and his passion for curating dishes using locally grown and ethically sourced produce floods the already energetic team with a sense of reason; that this might just be a truly authentic ‘Seasonal, Earth to Table’ experience; one that goes beyond being a concept, and becomes a culinary reality. As is the ethos in everything they do here, the new menu pays a dutiful homage to its environment and the exotic bounty provided by Bali and its surrounding regions. Copper Kitchen & Bar, and its exclusive, warm, rustic rooftop location, will offer a new paired- down vibe, in the most serene of surroundings. Lush forest canopy, paddy fields and volcanoes provide an enchanting backdrop for which guests can get together and decide their own dining experience. Be that a quick bite for lunch, shaded beneath the palm fronds, or a leisurely evening dinner under the ever present glow of moonlight and starry skies. The reinvented vision is a welcoming one, delivering a non-fuss communal menu which will be seasonally revised and stay sincere to local produce; much of which sourced from the new Chef’s own labours at The Gardens at Bisma Eight, the Tegallalang Reserve and Amed Fisheries. “As Ubud’s new stewards of the land, we define our own provenance and minimise the number of hands between Earth and Table, as an inherent responsibility to feed the finest our terroir’s can provide” said Chef Ben. A long standing patron of the region, Chef Ben believes that: “People come to Indonesia to eat Indo-Asian food, so my idea is to have a menu that offers contemporary Asian food, with an international twist” This is sustained by the plentiful, local resources that Copper affords, and there is a unified belief, passion and purpose behind the vision. The whole team at Copper live and breathe a mindful, and wholly committed homage to Ubud and its surrounding regions. The tale of Copper Kitchen & Bar began in February 2015, and as it approaches its second anniversary, the warm, rustic, charm and unrivalled vistas from the rooftop are infinitely complimented by an unwavering respect for their surroundings. Working in synergy with nature to create an unparalleled dinning experience, a manifestation of the teams labour of love if you like; and with Chef Ben McRae now leading the charge, the tale extends beyond the fresh innovative flavours, beverage pairings and artistic presentation, to leave guests with warm smiles, fulfilled hearts, a real sense of inclusion and their own stories and tasting tales to tell. Copper Kitchen & Bar is a seasonal earth-to-table dining experience, staying true to the local produce sourced from the farms of The Gardens at Bisma Eight, Tegallalang Reserve and Amed Fisheries. Stay authentic, ethical, and inspired. They say that the dream honeymoon involves days of lying in the sun with the mercury teetering towards 28ºC, a couple of not too wordy reads close at hand, and one or two...or, maybe three ice cold cocktails to enjoy; oh! and of course the chance to slow down and romance the evenings away with your one true love. Throw in lush, tropical green canopies, alive with the jungle’s chorus, and views that reflect off of the infinity pool and just go on for days, and you have the most perfect antidote for the chaos that was the last few months of wedding planning and the ceremony beyond. But it's not just newlyweds who are adopting Ubud’s most serene of addresses, Bisma Eight, as their escape for a taste of authentic lovers paradise; with their tastefully curated package “The Honeymoon”; the Bisma Eight family are inviting couples, both anew and seasoned to take their foot of the gas, reconnect, and just simply be together, as their expert team deliver you moments of tranquility without you ever having to leave the hotel. Bisma Eight do slowing down like no other, and this resonates through the stunningly appointed guest suites and architecture, to the bespoke gardens and walk ways, so designed as to give you a whole sensory experience as they blend effortlessly into the vibrant and rich jungle that surrounds them. Aside from the complimentary return airport transfers, “The Honeymoon” offers couples the chance to really switch off and soak up each other’s affections, as Bisma Eight’s very own Copper Kitchen & Bar provides the idyllic setting for a romantic 4-course meal, specially crafted by their award winning, in house Executive Chef, and as the majestic Ubudian sun begins to disappear behind the forest wall, continue to the alluring and charismatic rooftop bar for the best views imaginable. Loose yourself in each others company as hand in hand you watch day turn to night, savouring an hour of sundown cocktails, and more intimate moments shared. Choose to stay a while longer if you desire, no-one here will rush you; though once you are ready to retreat to your private Forest Suite, you will find your bed turned-down for your comfort, and your very own sanctuary to call it a day with a soothing 60 minute massage, literally side by side. Bisma Eight is the most special of destinations for beginning your new life together, or rekindling moments of enchantment and romance for those more practiced of sweethearts, but regardless of how long you have known each other, Bisma Eight offers every couple a place to create new memories that will last a lifetime. The lunar calendar has its place in science, mystery and folklore; but regardless of which you gravitate towards, no one can refute the intoxicating aura that a full moon brings upon us. When the moon moves into its most illuminated phase, the darkest of night skies become a place of wonder and clarity all at the same time, and this is not more true than the mesmerising play of light that can be seen from the rooftop at Copper Kitchen & Bar, Ubud. Copper Kitchen & Bar and Executive Chef, Ben McRae, bring an authentic six course Dégustation that immerses you and your guests in a moonlit dinning experience beneath the Ubud stars. Beginning on Thursday January 12th 2017, the Balinese dinner will take place every month as the full moon graciously glows high above the jungle tree tops; casting shadows and a starlit ambience over the place settings; adding a mise en scène to Copper’s warm and rustic charm. The perfect setting for friends, family and kinfolk alike to congregate and converse, whilst sampling Ubud’s finest tastes of Bali. Sip on the crispest Chardonnay as you dip into line caught sashimi, or soak up the rhythmic sounds of the surrounding tree canopies with a craft beer or two, whilst you whet your appetite on corn fritters with chili jam. If this isn’t enough to awaken all of your senses, then the evenings entertainment is sure to delight. The accomplished and ever present team at Copper will tend the evening in customary dress and indulge you with traditional Balinese dance; where you can choose to join in the frivolities, or simply sit back, have your waiter pour another tipple, and applaud from the comfort of your own table as the courses continue to flow. Copper Kitchen & Bar provides the food and beverage, and of course the enviable lush jungle surroundings, and the moon and stars will bring a soft, enchanting shimmer to proceedings; but as Suraj Melwani, founder of Bisma Eight so wisely proclaims, “It’s the people that make the best injection of culture to any brand”. So come and join us! Dine with us for the most authentic, ethical and inspired Balinese Dégustation in town, as new friends and old dance the night away in the most serene of rooftop settings, and relax as the hypnotic Ubud sky affords you and your guests the greatest show on earth. For more information, images, and content please contact: Caoilfhionn Maguire or Robbie Woodward at Ohana Communications. Bali offers something to the spiritual palate of the modern day traveller which they often can’t find at home; peace and reconciliation toward the celebration of life. The spirituality of the local community is infectious and has meant that Bali has been dubbed as one of the most zen travel destinations in the world. The spiritual and cultural hub of Bali is Ubud, the host town of the Bali International Meditators Festival and film location for popular blockbuster Eat Pray Love, so naturally is the ideal destination for Vanessa Van Houten to exhibit her latest photography series, RAW. RAW, is a series of 71 portraits photographed as people revisit a moment of loss from their past, which is presented alongside their written thoughts on the personal loss. Bisma Eight is proud to be the acting gallery space for this contemporary art exhibition. The hotel, a spiritual oasis in itself, is open to support this type of creativity and creative freedom, as it heightens the spiritual awakening of guests and locals alike. The exhibition will run from December 24th up to the end of February 2017 and will be open to the public. Vanessa Van Houten has also released a photo book of the wildly popular exhibition, also entitled RAW. The photographer will host a book signing in The Library Café, Bisma Eight on Friday January 13th 2017 for a small crowd of 75 invitees. Complimentary canapés and wine will be served to all invitees, allowing them to relax and engage with the exhibition while also having the chance to speak with Vanessa. Don’t fret if you can’t make the book signing, as spirituality is about living a stress-free life, so Bisma Eight and Vanessa plan to host a second meet-and-greet day at the hotel in January by invite only. Vanessa Van Houten was born in San Rafael, California in 1971 to an American Pan Am pilot and a free-thinking German and spent her early childhood in the Bahamas and Berlin. After the divorce of her parents, she gained a beloved Japanese stepmom and her youth was divided between the small town Augsburg, in Germany and San Francisco. Currently Vanessa lives with her husband Daniel and three children Peppa, Ziggy and Sonny in Jakarta, Indonesia. RAW is her first Photography book. Her other photography series, which were shown at exhibitions include Paperfold (2012), Taboo (2010), Remembering what’s lost (2009). As a director she realised various award-winning movies, which are Paper Bird (2007), Karma Cowboy (2001), Mona (1998), New York Images (1996), Alps (1995) and Growing Silently (1994) shown on German TV and screened at international film festivals. Time in Ubud can make days feel like weeks and weeks feel like a lifetime, in a really, really good way. So what better place to ring in the New Year than with a seemingly endless night at the Moonshine NYE Party by Bisma Eight. Enjoy beautifully crafted tapas by Ubud’s most exemplary kitchen, while sipping on sundown cocktails, marvelling at Ubud’s foliage-rich horizon, where a New Year will soon rise. Dj Ebes will set your night off as Dj Taufan brings it to a close under the unadulterated Bisma night sky. Adorn yourself in your finest garments for the chance to win a two-night stay in Bisma Eight’s Canopy Suite, a tranquil oasis of cool where any good year should begin. Dust off the woes of 2016 with stellar entertainment and house-crafted cocktails as you cast your wishes for the year ahead, under the moonshine in Bali’s spiritual capital. Best Dressed wins a 2-night stay in one of Bisma Eight’s breathtaking Canopy Suites. T&C applied. Ubud is the beating heart of Bali and where culture reigns supreme, but for Suraj Melwani, founder of Bisma Eight, its people that make the best injection of culture to any brand. This mantra is all too prevalent in the round-up of events that Bisma Eight have curated for the festive season, not least the Copper Moonshine NYE Dinner. Bisma Eight invites natives and expats alike to join together in the 6-course extravaganza at Copper Kitchen & Bar, to celebrate different cultures through food, tradition and people, as 2017 is brought in under the perfect Ubudian moonlight. Copper Kitchen & Bar is Ubud’s premier dining delight; not least for the soul-enriching dishes that comprise the Moonshine NYE menu - Authentic food created using local and exotic ingredients, mastered with refined techniques that will see diners tastebuds dancing into the future. Known for their all-embracing approach to culturally explorative cuisine, Copper Kitchen & Bar wants to bring together a world divided by 2016 through a feast of artfully crafted fare to be shared and enjoyed with your neighbour. Afterwards, escape to Copper’s rooftop bar where you can ring in the eagerly anticipated New Year with a complimentary front row view of the stars. Ubud instills a transcendent energy in its people and its land, fostering unbreakable bonds with the two and forming relationships between the each that far outshine that of any other Balinese destination. Sustainability, honesty and spirituality govern life, not only in Ubud, but at Copper Kitchen & Bar by Bisma Eight. Here there is an emphasis on the harmonious relationship between the land and its people, practiced through the restaurant’s Farm to Fork Dégustation. Sourcing food from Bisma Eight’s own organic farm ‘The Gardens’, Tegallalang Reserve, and Amed Fisheries, Copper Kitchen & Bar invite guests to join in the 6-course gastronomical delight that pays homage to the land that surrounds the restaurant. Relish in the earthy delights of the crusted eggplant amuse bouche, chilled avocado and celery soup, before tantalising your taste buds with the freshest salmon roe imaginable. Experience the succulent flavours of Bali pork hock and wood fire black cod, accompanied by Bisma Eight’s homegrown vegetables, before finishing off with a classic Indonesian semi freddo. At the Farm to Fork dinner, today’s ingredients take centre-stage to a lip-smacking applause. There’s much to be said for a home cooked meal, but even more for one that’s homemade from earth to eatery, farm to fork. Ubud, despite the influx of tourists and expats, has managed to artfully maintain the traditions of Balinese culture; and nowhere more so than Copper Kitchen & Bar by Bisma Eight, where guests are invited to dive in to the all-embracing flavours and offerings of a 6- Course Traditional Balinese Dégustation. A careful, appreciative tasting of distinctive foods focusing on the senses, high culinary art and of course, great company. The globally influenced team have ethically curated an evening to delight, sourcing their ingredients from the lustrous Indonesian lands and oceans that surround them. The chefs at Copper Kitchen & Bar have crafted the 6-course menu to include traditional Balinese and Indonesian dishes, as well as putting their own twist on proceedings with subtle, yet tasteful, international recognition. Guests will have the chance to try iconic favourites such as Bebek Betutu and Klepon, while getting a taste of the Copper Kitchen flair on dishes such as ceviche. It is a Balinese tradition to offer food to the deities and the 6-Course Traditional Balinese Dégustation is worthy of just that. Following your meal there’s the chance to truly immerse yourself in Balinese culture with an evening of traditional Balinese dancing. The intensely expressive dance culture in Bali is central to religious and artistic communication; with stage play as colourful as the costumes, guests are in for a spectacular evening of homage to Bali. A fan of open spaces and wasting the day away in the Balinese sun, founder of Bisma Eight, Suraj Melwani believes that there’s something about easy food and open spaces that resonates with people, so he’s chosen to draw these two comrades together and throw a Cinema Cookout at Copper Kitchen & Bar this festive season. The post-Christmas “What to do?” is usually filled with stress, gridlock, day old turkey and plummeting temperatures, but definitely not in Ubud. This December, Bisma Eight helps to answer that very question for you, and invites you and your nearest to kick back and look at the bigger picture. Enjoy free flowing BBQ and tapas dishes while watching some of Hollywood’s biggest blockbusters underneath the Balinese nightscape. Ubud’s only open-air cinematic dining experience at Copper Kitchen & Bar is open to guests and populace alike, with popcorn and bottomless tipples bringing people together through the love of film and great food. Grab a friend and head on over for an evening that you wont get from your latest movie subscription. Bali might not be the first thought that springs to mind when someone mentions Christmas, but with the festive offerings available at Copper Kitchen & Bar by Bisma Eight, Ubud will be the only destination on people’s psyche, their lips and their travel tickets this year. Bisma Eight have pulled out all the stops this holiday season, with Cinema Cookouts and New Year’s Eve parties, but the star of the show, the reindeer leading the way, if you will, is the “Copper All the Way” Christmas Dinner. What better way to celebrate Christmas Eve and Christmas Day than with free flowing sundown cocktails at the Copper Bar Rooftop, before a 5-course Christmas Dinner at the Copper Restaurant Rooftop. Or better still why not do both? It’s Christmas after all! Ever felt like your vacation never seems to last long enough? We’ve all been there, and as disappointing it may be, a vacation extension is usually down to the purse strings. Great news then, that Bali’s leading resort in Ubud, Bisma Eight is offering you the chance to extend your stay on the Island of the Gods, and making paradise infinitely more affordable. If it’s an intimate tropical-modern lush escape that excites you, why not stay longer at Bali’s top luxurious boutique resort, and save up to 25% on all your night stays. Oh, and one more thing, they’re throwing in a complimentary daily breakfast for two as well. As if the view from the infinity pool wasn’t enough to entice you! The only decision left to make is how long will you stay for? Start your story and stay longer with Bisma Eight now. Stay period from November 2016 until March 31 2017. The offer is not available from December 20 2016 to January 9 2017. Offer is valid if booked directly on the Bisma Eight website www.bisma-eight.com. Offers are not valid in conjunction with any other offer or contract. Rates are per room, per night, vary by arrival date and/or length of stay, and do not include applicable taxes, service charges, nor surcharges, unless otherwise noted. In this year's Bali Tourism Awards 2016/2017 Bisma Eight has won Bali Leading Resort in Ubud. Bisma Eight is a luxury boutique hotel experience set within the natural and cultural heart of Ubud. In just one year in operations (launched in 2015), Bisma Eight has already received various travel awards from its peers in the industry and endless hats-off from fellow travellers. The objective of this event is to create an awareness of the indispensable service-quality providing in the Bali travel and tourism industry, tone of the most visited and developed tourist destination city/island of Indonesia with presence of more than 3500 hospitality brands, so that they always strive in assuring the quality and prove strong brands serving the Indonesian market. As part of foundation’s corporate social responsibility, ITTA Foundation (Indonesia Travel & Tourism Awards) today unveiled to the fellow Industry its new focused award show Bali Tourism Awards 2016/2017. Last year the foundation generated 200 nominees and 32.000 voters from 23 countries. A comprehensive Board of Advisors, exemplary travel individuals from various travel and tourism backgrounds is appointed to perform the qualitative selection process. The Foundation make it top priority to acknowledge, nominate and select the best brand and people in the industry. Votes were casted by thousands of travel professionals which include hotels and resorts, travel agencies, tour and transport companies and tourism organizations in Indonesia and various other countries across various continents. Bisma Eight accepted the honor and showed their appreciation to everyone in the industry who has supported and expressed the confidence in them, as it has opened broader possibilities to always give the best to achieve more and sustain. This autumn, Bisma Eight invites you to ditch the sweaters and soak yourselves up in some of the best weather in the tropics. Bisma Eight got you covered when you book your stay before September 15th to stay between November 1st and December 15th 2016, where you can get your 4th night stay free. Pack your tropical gears and stay for four nights and pay only three at Ubud's finest hidden gem ! Folk Kitchen & Espresso’s not your average café. The masyarakat (brothers and sisters) behind the kitchen are looking to spread the love and knowledge through a series of morning baking workshops during the course of the Ubud Food Festival this year. Each morning, Head Chef Roy Qira will get his hands dirty in leading folks through a series of hands-on baking demonstrations. Supporting by his side will be Bisma Eight’s Executive Chef Duncan McCance. Catch up with the crew post demo over a signature hearty breakfast and some of Ubud’s best coffee. Folk is completely equipped with a fully commercial baking kitchen so be sure to soak up as much info from the crew as possible. Not sure about joining us? Well, If you knead dough, you can always get a starter job at the local bakery after. Spots are limited to 8 people per session so don’t sleep on this one. If bread’s your kryptonite, and bread puns are your jam, then this is event can’t be missed you weirdoughs! Folk's Wakey Wakey Workshop is one of the official special events of Ubud Food Festival 2016. All staying guests at Bisma Eight hotel during the festival will get a 20% off on Folk's Wakey Wakey Workshop event tickets. Bisma Eight and its kitchen crew are pulling together a 3-day special event during the Ubud Food Festival this year at its own organic farm, The Gardens. In keeping with the spirit of Community, Bisma Eight will be hosting a family-friendly picnic event that’s long overdue. Joining the crew will be local school children contributing and expressing themselves by turning the grounds into a fun and creative community picnic fair. Both the school and Bisma Eight will assist in raising fresh juice and snack stalls for everyone who joins them at the farm. Towards the end of each day, 15 potential chefs will don their clean aprons and get messy in a one-hour cooking demo led by Head Chef Agus Pardiasa. Joining him will be Executive Chef Duncan McCance and old friend Chef-Director Jesse McTavish. This one’s sure to be the most talked about event of the food festival! All foodies can select pickings and other produce directly from The Gardens; as often as possible. Keeping in tune with Bisma Eight’s dedication to the community, all proceeds from this event will go to charity. Get your Panama hat and sunnies ready! The Gardens' Community Roundup is one of the official special events of Ubud Food Festival 2016. All staying guests at Bisma Eight hotel during the festival will get a 20% off on The Gardens' Community Roundup event tickets. Copper Kitchen & Bar is excited to announce a collaborative cook-out between two Melbourne locals in Executive Chef, Duncan McCance (Bisma Eight, Copper Kitchen & Bar, Folk Kitchen & Espresso), and Jesse McTavish of Top Paddock and The Kettle Black fame. On this 2-day Ubud Food Festival 2016 special event, Copper Kitchen & Bar hosts a 7-course dinner at the restaurant’s rooftop where food and drink enthusiasts gather to be blown away by one of the food festival’s most epic get-togethers. This one’s a mash-up of two seasoned chefs coming together and kicking it behind the kitchen. These guys are ready to blow their own minds! In paying homage to Ubud’s surroundings, this 7-course culinary collaboration will feature a diverse serving of Duck and/or Rice in each dish as main elements whilst incorporating their own unique perspectives throughout. Duck and Rice are about to get a new-school makeover courtesy of Chefs Duncan and Jesse like you’ve never seen. Minimal fuss, maximum fun; this dynamic duo looks to inspire and surprise your taste buds throughout the evening. Duck in and don’t miss out on another one of Copper’s treats throughout the festival! Copper’s Rooftop Cookout is one of the official special events of Ubud Food Festival 2016. All staying guests at Bisma Eight hotel during the festival will get a 20% off on Copper’s Rooftop Cookout event tickets. In a bid to up the ante, Copper Kitchen & Bar is ecstatic to Introduce Duncan McCance or “The Beard” (as he’s referred to in closer quarters). Duncan hails from Melbourne having spent time at some of the worlds best restaurants in Orana (Adelaide), Ekstedt (Stockholm), Burnt Ends (Singapore). He has a deep affection for sourcing locally, while using techniques that result in food that embrace the restraint synonymous of a contemporary kitchen. He credits his early years as some of the inspiration behind his current creative direction. Growing carrots with his Mother paved the way for a greater appreciation of sustainable cuisine. At Copper Kitchen & Bar, he aims to work with locally sourced produce, tying in The Gardens Permaculture initiative into the hospitality supply chain. There is a synergy between Duncan and his new found base. With Ubud being the Island’s center of craft and culture, it’s no surprise he’s found solace in a city that puts craft at the forefront of it’s DNA. The slightly off-beat cache of Ubud syncs in seamlessly with his personality, providing him the ideal place to truly explore and deliver a cuisine that’s always refined yet restrained, progressive yet pragmatic. Duncan McCance, Melbourne born. Scottish father, Australian Mother. Trained in Melbourne before moving to London at 21. Worked at Burnt Ends (Singapore) after owning his own place in Melbourne. Featuring our updated menus for the restaurant, Copper Kitchen & Bar, simplicity is king. Bisma Eight and Copper Kitchen & Bar are doing it again, beautiful tents are set up over the rooftop bar and restaurant, stiff drinks, crafted tapas, enjoying the sunset vibes over the Ubud forest every afternoon, a full chilled-out week of festivities, starting from December 26th through 30th 2015, music is styled by Bisma Eight’s own beat curator, Ebes Rasyid. Come see us in the tropics! Capping off a successful maiden year as one of the more innovative hotels in and around Ubud, Bisma Eight announces the closing of this year’s theme with “Copper Stars and Sparks”. Doing things in true Ubud fashion, its dining experience and countdown gathering at Copper Kitchen & Bar will be serving up relaxed vibes of Ubud under the star-studded Bisma sky. Opening its door for Ubudians and everyone on the island, Bisma Eight is enthusiastically gearing up to host a week of festivities in true Ubud style; a stunningly laid-back venue, stiff drinks, soulful people and music fit for a charmingly nostalgic evening. The folks at Bisma Eight are rolling up their sleeves to show everyone how it’s done. Choose from up to four distinct categories of a 5-Course Set Menu on the evening of December 31st before the ‘Stars and Sparks’ countdown moment. The next day, Ring in 2016’s first afternoon of the year over a 4-Course set brunch menu, communal dining, resolutions and hangover cures at Copper Kitchen & Bar. Relax, unwind at the city’s laziest brunch spot. Nothing like bringing in the new year in sleep gear from the last. Prior to joining one of the three “Copper Stars and Sparks” New Year’s Eve and Day events, guests are urged to share any specific dietary requirements and/or restrictions as the Bisma Eight team are readily available to cater accordingly. Attention to detail in creating the most thoughtfully curated product is second nature at Bisma Eight’s restaurant, Copper Kitchen & Bar. Have the Sweetest Twenty Sixteen New Year! Bisma Eight, a luxury boutique hotel in Ubud, proudly presents “Copper All The Way" - A selection of Christmas events for locals and international guests spending their Christmas holidays on the island. This year, in the spirit of Christmas, Bisma Eight pulls out all the stops and is going “All The Way” with some real show stoppers. Beautifully crafted menus for maximum nostalgia, tasteful decor and intimate activities to close off the year in true holiday form. The Copper "All The Way" dinner gives revellers a chance to experience a 5 course dinner menu on two festive evenings, Christmas Eve (December 24th) and Christmas Evening (December 25th, 2015). Those looking for something a little more family-oriented can join Bisma Eight on the morning of the 25th of December for a lazy Christmas brunch. Bisma Eight’s Copper Kitchen & Bar will play host to all three events at the indoor and outdoor rooftop areas of the property – decorated in a paired-back, island-inspired style with funk music from our resident beat junkie and Art Director in, Ebes Rasyid (@abcdebes), it's going “All The Way” the Ubud way. Prior to joining one of the three Copper "All The Way” Christmas events, guests are urged to share any specific dietary requirements and/or restrictions as the Bisma Eight team are readily available to cater accordingly. Attention to detail in creating the most thoughtfully curated product is second nature at Copper Kitchen & Bar. Have a very merry Copper Christmas! Bisma Eight, a luxury boutique hotel in Ubud, proudly presents a bold new menu geared for a more romantic dining experience for Bali residents or international honeymooners spending a few days on the island. The Romantic Dinner Package menu was thoughtfully crafted with love by one of Ubud’s finest chefs, Bisma Eight’s own, Shima Drupadi. The romance and nostalgia in Ms. Drupadi’s creations can be experienced in the 5 Course dinner menu. 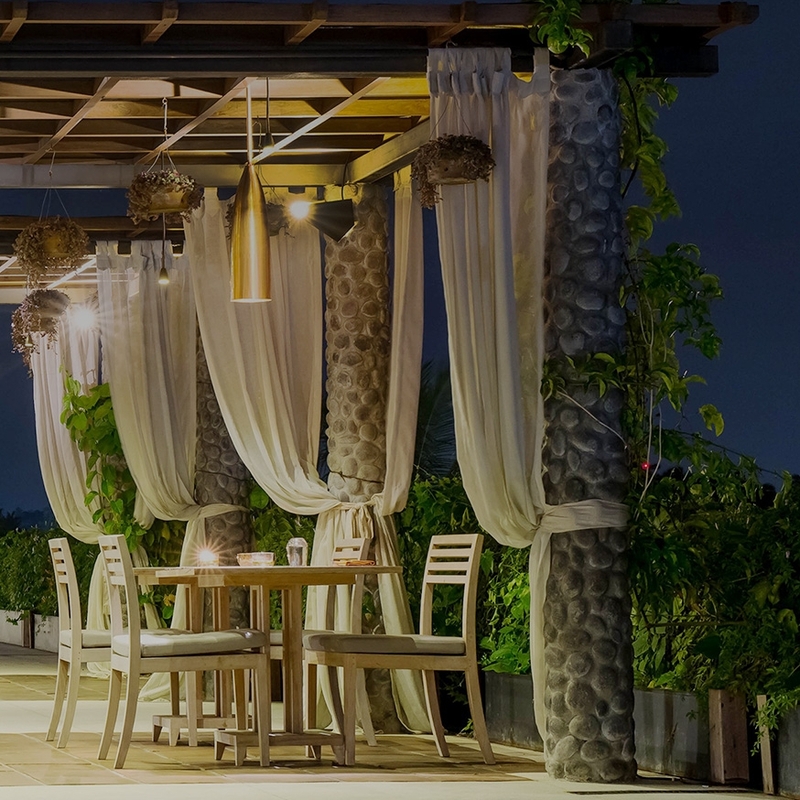 The dinner will be set up privately at Bisma Eight’s Copper Kitchen & Bar – A rooftop location, floored with floating candles, equipped with an intimate outdoor lounge painstakingly setup for couples looking to slow down and connect again. Watch the stars under the Bisma sky and snuggle up with cozy blankets when the Ubud chill takes over. This is one romantic dinner minus the cheese. As much of the produce prepared are sourced from The Gardens, Bisma Eight’s own grown organic farm, and as Copper Kitchen & Bar’s chief in-house foodie says, “We try as much as possible to source select produce from our organic farm just down the road. We feel that by integrating The Gardens more, guests will get to experience a whole new way of consuming food and drink. Knowing where your food comes from is important, which is why carving out menus at the restaurant are that much simpler with nature dictating it's direction. The folks behind Copper’s kitchen are the ones providing the food with immense depth." In trying to keep service standards always personalized and truly bespoke, Copper Kitchen & Bar only accepts one booking (one couple) each night for its Romantic Dinner package. Staff stand-by to engage, deliver and accompany guests throughout the evening, taking care of intended set items as well as any extras. Prior to joining us, we ask guests to share any specific dietary requirements and/or restrictions as the team are readily available to cater accordingly. Attention to detail in creating the most thoughtfully curated product is second nature at Copper Kitchen & Bar. Come see us. A burst of requests from the guests, many fans and followers to have a series of food-centric journey for them to experience, Bisma Eight has finally released The Foodie Frenzy. Immerse and share in the love of food & beverage at Bisma Eight with a conscientious yet modern approach to Asian cuisine, Copper Kitchen & Bar puts forward a refined take on comfort favourites crafted with a local sensibility. If it’s a food-centric break you need, Bisma Eight does it like nobody else. Prior to joining The Foodie Frenzy, guests are urged to share any specific dietary requirements and/or restrictions as the Bisma Eight team are readily available to cater accordingly. Attention to detail in creating the most thoughtfully curated product is second nature at Bisma Eight’s restaurant, Copper Kitchen & Bar. For the love of food, salute to all foodies!